1918 and the trade in mysticism and séances is booming in London given the carnage in France and Flanders. WB Yeats, Ireland’s most famous literary figure, is living in London with his young wife. He’s haunted by both his long-term, failed romance with the actress and nationalist, Maude Gonne, and by the ghost of a young woman washed up on the shore in his home county of Sligo. Yeats visits spiritualists, along with Charles Adams, an apprentice ghost hunter for the Hermetic Order of the Golden Dawn and disillusioned medic. Determined to solve the death of Yeats’ ghost, Adams travels to Sligo by steamer, along with a disguised Maude Gonne, now a central figure in the nationalist movement, The Daughters of Erin, and Wolfe Marley a British agent. There, below the imposing mountain of Ben Bulben, he is plunged into a society in turmoil -- Ireland is on the brink of revolution, republican and nationalist movements mobilising support, the Irish gentry, part of the British aristocracy, is anxious about the future, and the local police seem to have their own agenda. Feeling distinctly out of place and unsure who to trust, Adams starts to investigate the death of Rosemary O’Grady. Anthony Quinn has a very nice passage in The Blood Dimmed Tide that contrasts the Anglo-Saxon faith in science and reason and the Celts belief in the magical and mystical. It’s the central tension developed in the story, but also an important distinction with regards to readership, I think. 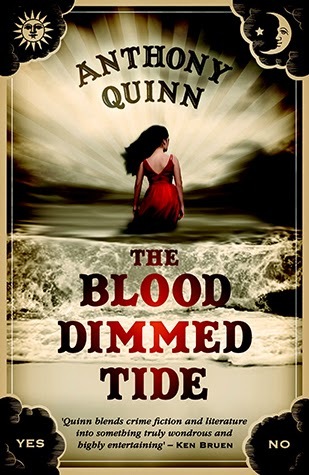 Quinn is no doubt a fine writer and storyteller, as is evidenced by his first novel Disappeared, but I struggled my way into the first part of The Blood Dimmed Tide exclusively, I would hazard, based on my Anglo-Saxon scepticism with the supernatural and paranormal. Any story involving WB Yeats, however, is inevitably going to have to be rooted in these concerns given his lifelong obsession with them -- he joined the Hermetic Order of the Golden Dawn in 1890 and belonged to the ‘Ghost’s club’. As the story unfolds, it shifts from being rooted in the supernatural to explore various tensions between mysticism and science, nationalism and unionism, law and criminality. The result, for me at least, was a progressively more entertaining amateur sleuth story set at an interesting time in Ireland’s history, populated by a couple of its most famous figures (Yeats, Maude Gonne). Overall, an out of the ordinary tale, that might at first appeal more to Celts, but won this Anglo-Saxon round.